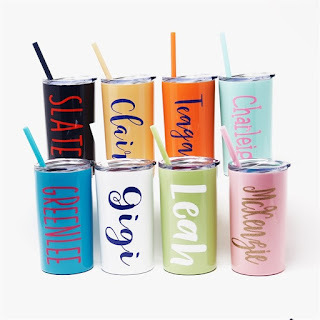 Grab a few of these Personalized Mini Slim Tumblers ( 12 oz is the perfect size) for $13.99 (Retail $24.50). This is a Premium Quality 12-ounce tumbler in new colors with lid and straw. The Copper vacuum insulation keeps your drinks cold for 24 hours, hot for 12. Glitter Pattern Personalization is available and a favorite!